Arjuna continues his pilgrimage, khsatriya style, and it is very different! When learning archery from Drona, Arjuna was friends with Gada, a cousin of Krishna. Gada had spoken so much about his cousin Subhadra and her beauty that he had fallen in love with her without even seeing her. He now remembered her and considered ways and means of seeing her without being seen. He knew that she was in Dwaraka. The story, a love story, is the basis of movies and plays in many Indian languages and is known to most of us. Author Kamala has also crafted a sweet story! Arjuna disguises himself as an Yati and goes and stays in a place near Dwaraka. 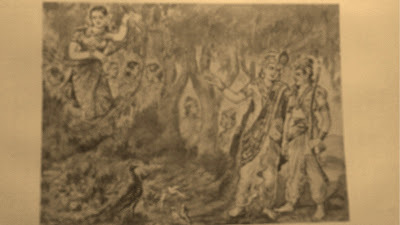 Krishna divines the intention of Arjuna and goes to meet him. Arjuna finally sets his eyes on Subhadra and is totally captivated by her beauty. Krishna manages a meeting between Arjuna and his half-sister Subhadra and she falls in love with Arjuna. They get married in the Ghandarva style when the rest of the family is away and elope. Krishna convinces an angry Balarama, who is all set to chase and kill Arjuna that it is best to accept, as he is a worthy husband to their sister. As they reach Indraprastha, Arjuna is worried about how Draupadi would react, so he sends Subhadra, dressed as a milkmaid, ahead to meet Draupadi. Subhadra introduces herself as Krishna's sister. Meanwhile Arjuna meets his family and tells them about Subhadra and finally goes to Draupadi. She smiles archly at him and says: 'Do not worry. I have already met the milkmaid. She is very beautiful'. She takes the coy Subhadra in her arms and says: 'Who can resist you and your beauty? You have won my heart already, within a few moments. What chances could poor Arjuna have had against your charms?. A few days later, the Vrishnis arrive in Indraprastha bearing costly gifts and celebrate the wedding of Arjuna and Subhadra. It is different in Vachana Bharata: Arjuna forcefully abducts her, as advised by Krishna, in the true style of khastriya. Balarama reacts to the abduction thus: 'I suggest we chase them immediately and destroy the Kauravas'. Krishna tries to calm him and others equally agitated, 'Arjuna has not insulted our clan, in one way it is an honor. He did not think us greedy, only thinking of the wealth the suitors would bring in a swayamvara! There is no adventure in a swayamvara. Kanyadhana is like passing cattle from one hand to another.There is no prestige in it. A man does not sell his daughter, so Arjuna had to abduct Subhadra. Even this act is Dharma and moreover, this connection is a good one, praiseworthy. Arjuna is from the lineage of Bharata, son of Kunti, even Indra is no match for him in valor. It is not easy to fight him, especially as he is on my chariot drawn by my horses. Imagine the ignominy in case he beats us and escapes into his city. We loose nothing if go in peace and bring him back'. Thus convinced they go in peace and get Arjuna and Subhadra back and perform the wedding. While the story takes our mind off the conflict between the cousins. It also tells us more about Krishna, his negotiating and convincing skills! It also introduces us to the very trusting and straight forward brother, Balarama, who is no match to Krishna in getting to the essence of conflicting issues. As I think about the distance between Dwaraka (in Gujarat) and Indrparstha (Delhi), I wonder about the time Arjuna and Subhadra took to reach Indraprastha. It seems more plausible that they returned to Dwaraka as narrated in Vachana Bharata.